CHARLOTTE, N.C. – Bullfighters Only is teaming up with Speedway Motorsports to showcase freestyle bullfighting to NASCAR fans for the first time in the sports’ history. 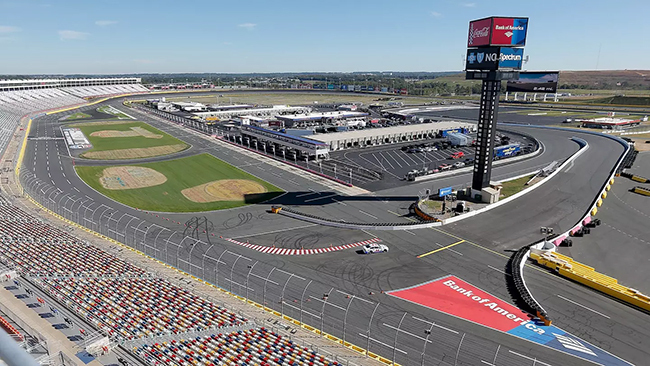 On Sunday, Sept. 30, nine of the BFO’s top athletes will be featured at Charlotte Motor Speedway’s Bank of America ROVAL 400. Three qualifying rounds of bullfights will take, with the winner of each advancing to the Hooey Championship Round at 12:15 p.m. Eastern Time. The roster is highlighted by veterans Ross Hill, Toby Inman, Kris Furr and two-time reigning world champion Weston Rutkowski. The solid cast of the sport’s rising stars includes Chance Moorman, Tucker Lane and Riley McKetterick, who will all make a bid for the coveted Charlotte title. Bullfighters Only is the premier freestyle bullfighting organization in North America that features the most elite athletes in the sport. It’s a gladiator event, man vs. beast in a battle of athleticism, wit and danger. Bullfighters have 60 seconds to engage an agile and aggressive bull that was bred for this kind of fight. Each move is countered, and points tell the tale. Bouts are judged on a 100-point scale, with half the points coming from the bull’s aggressiveness, and the rest coming from the bullfighter’s ability to stay close to the bull while maneuvering around and, sometimes, over the animal. It is appropriate that BFO’s first presentation is taking place at this particular race, where for the first time, drivers will battle for Victory Lane by maneuvering around a one-of-a-kind playoff road course. There is no denying that Bullfighters Only has reignited mainstream interest in freestyle bullfighting, and the popularity is only growing. The Charlotte event will serve as a pilot for potential event partnerships between Bullfighters Only and Speedway Motorsports in 2019 and beyond. Speedway Motorsports Inc. is a leading marketer, promoter and sponsor of motorsports activities in the United States. The company, through its subsidiaries, owns and operates eight first-class racing facilities in significant markets across the country.